10 years ago OsCommerce platform was a king of shopping carts – undisputed market leader, most of shops at those times were built on it. Now the market leadership shifted to Magento and almost noone uses OsCommerce for new shops, though according to statistics 7% of all webshops still use it. We have worked with OsCommerce when there were no alternatives to it. But when Magento appeared on the ecommerce market, we have understood the huge potential of this platform and since then offer Magento development services. There is no secret that programmers love to use modern fancy things and hate to use outdated tools, so you may find it a bit difficult to find people willing to support your old store. There are thousands of Magento development companies in the world, more than 300 of them are official Magento partners, it is a huge growing community. At the same time OsCommerce can not boast of such great number of partners. Only seven development and hosting companies have official relationship with OsCommerce, and programmers (except true enthusiasts) hate it. What is also great about Magento, that it being developed by a private company and they regularly introduce updates and fix bugs (every 10-15 days). Magento has been created to be extensible (that’s why it is beloved by programmers). The secret is in its flexible architecture and modular nature. Unlike OsCommerce, where core code, design and logic is mixed, every update requires modifying many files and merging with existing code, Magento well-structured and provides an advanced programming interface. The coding in Magento is based on the latest PHP 5 object oriented coding standards and Zend framework, which make the system scalable, more efficient, more secure and much easier to develop. There are also thousands of Magento extensions and design themes available, which can literally turn your Magento store into a space rocket. Multi store functionality is considered to be one of Magento’s most popular features, that allows you to manage multiple storeviews, stores and websites within one installation. Possible applications are: sites with same or different products on different domains, sites with same products but different design/functionality, multylingual webshops etc. Websites and stores can even share customer base, product catalog and settings based on how you choose to configure your sites. Layered/faceted navigation is another great feature of Magento, which lets your customers to find the products quickly by filtering them by many criteria like price, brand, size, etc. and to speed up the whole process of product search, and specific filter attributes can be set in Magento administration panel. Marketing and promotional possibilities packed with the software seem to be unlimited: related products, up-sells, cross-sells, gift cards, gift wrapping, discount coupons, multi-tier pricing for different quantities and customer groups (yes, you can create different customer groups like Wholesalers and Retailers), catalog and shopping cart rules, newsletters etc. 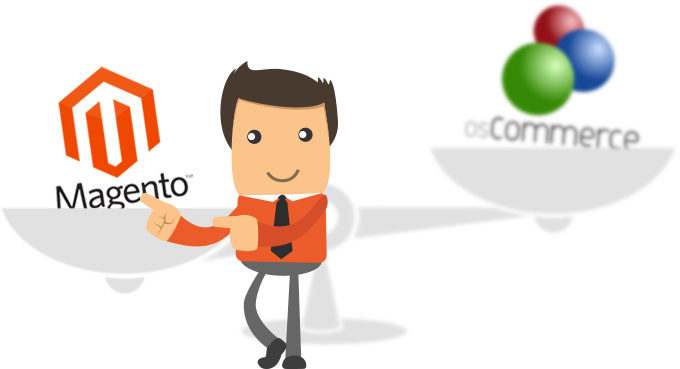 Even though OsCommerce’s backend is very user friendly for site admin, it also has less features that Magento has and that are really helpful. Besides standard things like catalog management, order management, reports it has advanced user management tool (you can create groups of admin users with different permissions) and advanced CMS with WYSIWYG Editor, which is designed to simplify web content creation. Even though Magento looks more attractive, migration is always risky, but you can reduce the risks by picking an ecommorce website development company that has done many migrations and can effectively handle those risks (yes, us:)). All data will be transferred, indexed old URLs can be saved (actually there will be redirection to new, better ones), the site will be greately improved. One thing you need to keep in mind when you decide to migrate your store to Magento platform, is that Magento is very resource consuming compared to OsCommerce (because it has very sophisticated design structure) so you would need a good hosting plan. Please feel free to contact us with requests/questions/consulting on migration and other Magento topics.